Firstly, HAPPY SPOOKY TIME!!! Here I sit, staring at these zodiacal glyphs and planetary symbols, pondering metaphor, the day of my birth and Hallowe'en while listening to Tom Waits' ‘A Little Rain (for Clyde)'. You can youtube it, it's really lovely. The day is settling in slowly and will be over before we know it, but there does seem to be a comfort about this particular holiday. No matter what you're dressed like, no one can judge you for it. Almost as if we can all be just a little more like ourselves, even if it's just by wearing a costume or a mask and at least, acknowledging it. Let's see what the stars have to say. The recent environments as of late, with Venus, Mercury and the Sun in Scorpio, will be changing, becoming a little less intense come Wednesday. The last two weeks have been on the crazier side of things. Actually, we see a shift where all three of these planets happen to move into the next sign of the zodiac, Sagittarius. The act of even the subject of travel will be of significance to key people, especially Sagittarians. This movement puts the focus on discovering the art, philosophy and religion of communication, love and self-identity for November and most of December. As for the Hallowe'en astrological weather... I remember a similar Hallowe'en to this a few years back. We can look forward to an extremely socially active holiday, with emphasis on the extreme. The subject or example of taboos may arise, like sexuality, religion, death, racism, anyt hing generally not spoken of commonly. We must watch for excesses and going overboard which really, isn't too far off any Hallowe'en but especially with this many planets in Scorpio; word to the wise, keep this well in mind. This isn't a generalization, after all, I'm not saying Hallowe'en will be mellower than usual or that it will be full of spontaneousness, no. I am saying it will be intense, magnetic, full of debauchery and excess MORE than usual and to watch your prospective, collective asses. Kosher? Wait, this isn't Chanukah. Please remember to read your Moon sign, especially if you were born at night though this applies for everyone, and your rising sign (or ascendent) for a broader, more accurate forecast. Your creative, spontaneous energies may be stifled right now so be aware of this. The lion in you comes out to prowl the freaky concrete jungle of either your home, work or the party-life, in that you're outwardly feeling pride, at the very least, if other energies are depleted. Embrace that. Let's hear you roar, or purr, perhaps. The intense energies of your opposite sign, Scorpio, may be getting to you a little, and perhaps you're feeling the strain. You may either be taken home or take someone home, but either way, something hits close to the home front, somehow. Take that how you will, it will manifest in your consciousness and outwardly so, anyway, whether you see it or not. You may be considering your possessions at this time, and how this affects who you are as a person. Perhaps many Geminian personalities are contemplating moving in with a significant other, or how close their friends are but certainly, there should be some thought on possession and ownership. Watch what's yours and what's theirs, how generous you are and how willing you are to integrate. A crescent waxing Moon in Capricorn this Hallowe'en has you feeling rather conflicted and of course, feelings are tumultuous. Don't be surprised if you find yourself reflecting or being faced directly with issues from your past. Your 'roots' come into question and what has grown from them, your history somehow coming into focus, as if it were more present than it seems. Planning on being more social than you regularly are? Like with Pisces, some of your only outlets right now lay in becoming extremely creative, in order to relate to others. So, for the thanks giving season, a cornucopia of events are on the celestial horizon. The Moon is as bountiful as the harvest this holiday, being full on Tuesday and the Sun enters Scorpio in the middle of this month so happy birthday to all of you Libras, in the meantime! The Sun and Moon are always in opposition when the Moon is full, each month. So, if the Moon is full in Aries, you know we're in October and the Sun must be in Libra, creating not just a tension or possible conflict but also a chance at resolution and to reconcile, unlike other more powerfully negative aspects in astrology. We also see Mercury in opposition to Jupiter, the outer planet usually exerting influence more over those closer to earth. In this case, there may be wonderful things on the forefront concerning social influences and productive communications ; However, the happy circumstances can easily be popped like a balloon blown up too big, if we are not careful to watch our own boasting. Like with turkey day, we hopefully have some things to be thankful for. Let us just make sure we treat one and other accordingly to the spirit of this tradition. The full moon in your sign has you seeing things through slightly erratic, through intensified futuristic inventor goggle lenses. You'll be challenged by things seeming to come at you like well aimed arrows, as if all of the issues are landing right on your philosophical bullseye, seeming to dig up deeper things that had been previously buried, mentally. You can either get pent up or run with it, overcoming by sheer amounts of effort. My advice to you: Don't give up! Channel it into stability, allowing you to draw back your own bow and shoot for the stars, hitting your target just the same as you were once hit. Taurus - Appease, May I Have Some More? With all this Scorpionic energy on the rise, you may be feeling slightly bent out of shape and prone to taking things personally, as Scorpio does and she rubs you the wrong way. Your ruling planet sits with her, now, forcing you both to get along and see each others point of view. But Jupiter is well placed to help you out. Bring great tidings and offerings (to yourself) and you'll be seen (by yourself) in a jovial, benevolent light, as well you should be; The inner chastising will be lessened and by doing this, offering to the self, a key will unlock a hidden door, more now than it had before! Give to yourself in ways you normally don't and don't fake it with things materialistically cushy, do the hard personal work. You're not quite used to being creative or artistic so much as you are to being talkative and quick-witted but at this time, it comes highly suggested from the universe that you tap into some form of creativity previously held under water, even if it's recreational drug use. Not that I'm suggesting you use drugs, heavens no... Mercury in Scorpio means that you get a taste of what it might be like to live in someone else's shoes, feeling nervous, self-conscious and a little intense, despite how cool you want to appear. How does one deal with this? Usually by holding grudges. Break free by overcoming and transforming by communicating forgiveness you never thought an option. Nothing right now seems to be effecting you much, in great and gargantuan ways. You're almost in limbo, Cancer, not even showing up on the radar but you are creeping into people's thoughts as you sift through your own. Being off your own personal radar and affected by very little directly, astrologically speaking, means you have a little time away from the narcissistic moodiness of your own emotions. Yayyyy! You can see through the grey clouds to the silver lining much more easily and more solidly than you usually can. Sit back, relax and enjoy life without so much turmoil. You know, Leo? Fittingly to your sign and its reputation for positivity and finding ways to deal, with pride and never get caught under the wheels of the car, I don't think I've ever managed to write a negative horoscope for you. You're hilarious and insufferable and out for war, this time! You're all charged up lately, wanting nothing more than to rekindle some old flames and sparks. You don't want blood, you want FIRE. Well, Prometheus or Promethea, let's see it then. Can you steal it from the Gods? Can you face the heat, in honesty, yourself? Come the next couple of weeks, you're going to be feeling out of your element, Virgo. With all the Scorpio on the rise, you may find yourself oddly disorganized or hyper intensified, which ever way your personal pendulum happens to swing. But either way, regardless of who you are, if Virgo is strong in your chart and you wear the archetype on your sleeve, get ready for some extra zest sprinkled or squirted in the eyes of your normally savory world. Just so you don't think I'm being overly generally, YOU, yes, YOU, Virgo, will be experiencing excess energy by Hallowe'en. For now, you're cruising. The Sun moves out of your sign and into the depths of Scorpio with such momentum, as many planets share in this shift from Libra to Scorp, that you hit the ground running. Like jumping from a moving vehicle that was trucking along quite nicely, suddenly the pavement moves faster under your feet than they can keep up with! And so, you slow down and are forced to stop to catch your breath. The only problem is that you're still stuck with your ruling planet in Scorpio and everything that comes with it. You'll be feeling a little tense this coming week. That's all I can tell you, so prepare yourself, mkay? Make sure you've got your jogging shoes. You're the guest of honour at a Scorpio party! Only problem is that all the other Scorpios skittering around there are, too. Scorpion mamas carry hundreds of baby scorpions on their backs, supporting large groups and you are ceaselessly embodying this concept in coming weeks, up to Hallowe'en. Feeling pressure from a many different angles, intense displays of emotion, outbursts of all kinds, positive and negative, and a whole slew of social conundrums and opportunities await you! Now, let's be true to Scorpio mythology and become hawks in the desert, soaring above with our innate ability to overcome through transcendence by spreading our wings. To fly or not to fly? That is the question. 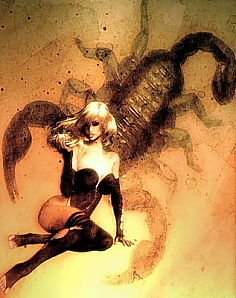 Lady Venus has temporarily moved into Scorpio as September moved into October and soon, Mercury will follow her there. The nature of Scorpio seems complicated, cerebral, deeply emotional and even sexual. How do these things apply to you? Ask yourself that question and bear in mind one thing to consider with this sign; consolidating extremes, even more than with Gemini, the twins. Scorpio speaks of polarities being excessive or extreme, not just of duality. Something else about Venus when she's in the underworld, we astrologers consider her to be in detriment; Think Persephone being held captive. To those who are able to see synchronicity or who might consider these underlaying esoteric or metaphysical influences, this means we may find worthwhile contemplation in this specific set of metaphors mentioned. Mercury went direct into Libra, there are many quincunx or inconjuct aspects occurring, Mars trines Uranus with five planets in Libra and intensity rising in Southern Alberta. Some kind of strange brew of seemingly irreconcilable differences within ourselves will be a bubblin', as the New Moon dawns on us tonight. New moons are the time for reflection, renewal, banishing and possibly even solitude. It's also a fruitful time for conception, of both new ideas and the planting of figurative seeds. Plant literal seeds closer to the Full Moon, suggested within seven days, for the gardeners amongst you. Take the two opposing forces within you, right now, and focus during the next week on integrating the knowledge you have, without overreacting or under-reacting or really, reacting at all. Just sit with what you have and concentrate on the dual dilemma indicated in your horoscope or seen through your own personal lens of interpretation. 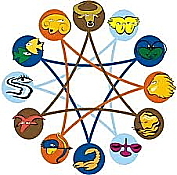 Remember a horoscope is general and at times, accurate but definitely not as much as a chart cast for an individual. Everyone's astrological signature is inherently different; Even twins. You'll be feeling a little extra creative this week, as your mind thinks more poetically than "normally," though it may be that type of poetry we saw H.P. Lovecraft conjuring in his famous writings. You'll find your mind positively buzzing, possibly more erratically you can handle. You are split between Self and Power; Creation and Idea. By Thursday, Saturn is on your side, helping you to merge the two world you face, at the moment with a bit of an iron fist. In some ways, it seems a very positive, controlled time for you. You find yourself torn between self love or personal reflection and expansion or growth. You'll be finding a balance where friendships are concerned, after a while feeling as if that area of your life somehow wasn't steadfast but creativity seems cut off by too much socializing. You have a lot of things coming at you, right now, making life difficult so it may be a rough week. Integrate communication and knowledge itself with your subconscious thoughts that you can see occasionally rising to the surface. The Moon, ruling your sign, finds itself also influenced indirectly yet noticeably by Libra, adding a little more of a positive, if indecisive vibe to your usual flow. You don't find yourself torn between so many things as people might find themselves torn between each other, with you as one of the social bystanders on the sidelines. Mars in your sign finds itself on cloud #9, concerning mental exploration. So, you should be hungrily, aggressively chasing after personal satisfaction on an intellectual level right now. Overzealous thinking and a lack of growing outwardly but much processing of character. Venus moved into Libra from Virgo, where the Sun and Mercury are, right now and Mars finally moves out of Cancer. This means all around less sensitivity toward the comments and actions of others and ourselves and more pride and positivity present where challenges are to be met. It's a sensitive time for you, especially concerning social situations. This can work both for or against you, depending on how you chose to handle it. Your emotions may be a bit fired up or so to speak. Take some time out for yourself, or even just being at home with family, if that's where you're comfortable. Ever expanding, you are! You might be feeling earthed or grounded, and seemingly more productive than usual, some of you might even be ultra organized. It's almost fall; Time to reap the harvest. Next Sunday and Monday will be a key days for you. Communications with people should be mellow and grounded, more than usual. Words will be well placed, despite an air of analyzing about many a conversation. The atmosphere of verbal productivity can work to your advantage. You should be feeling yourself simmer down come Monday, especially where your possessions are concerned, which includes your house and home or car. You can relax a little more when it comes to your relationships, as there are things you've been feeling uptight about for quite some time now since Mars entered your sign. Hey Baby— What’s your sign?